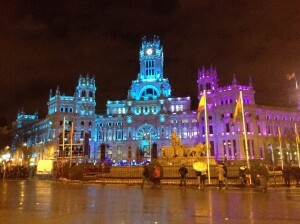 Carnaval (Carnival) was celebrated in Madrid a few weekends ago. Carnaval is related to lent and involves a lot of dressing up and celebrating. You can read more about it here. Some friends and I headed out Saturday night to catch the parade. For being first-timers at the parade, we did pretty well. We showed up five minutes before the beginning of the parade and scored an awesome place to stand. We were right in front of Palacio de Cibeles which changed colors throughout the parade. It was the perfect backdrop for our photos. Parades in Madrid are much different from the U.S. It is obvious that people are not too concerned about getting sued. Parts of the floats would extend into the audience, barely missing people’s heads. We stuck around after the parade to watch the firework show. It was the best firework show I have ever seen. The fireworks were synced to the music of an electric guitar symphonic orchestra. I was absolutely blown away. Check out the short video below! The weather the following day was absolutely gorgeous- a big change from Spring in Chicago. Everyone was out walking along the river without coats and getting pumped for the soccer game that night. I walked along the river to Atlético Madrid’s stadium to check out the pre-game festivities. Atlético Madrid was to take on Cristiano Ronaldo and Real Madrid. The atmosphere in Madrid was incredible. Everyone was sporting the gear of their favorite team and trash talking. Later that evening, I met up with some friend’s to watch the game at a restaurant near the stadium. On my way there, I heard the stadium erupt with sound when a goal was scored. It was unreal! The game ended in a 2-2 ties, so there was not excessive celebrating by either side at the end of the game. This weekend Barcelona travels to Madrid to take on Real Madrid. It is the only thing people have been talking about this week!